Need to create an appointment on Outlook.com? If you’re a heavy-duty road warrior, you probably keep your calendar on a smartphone for your own reference, but for everyone else, those appointments and meetings are very likely on an Outlook Calendar. 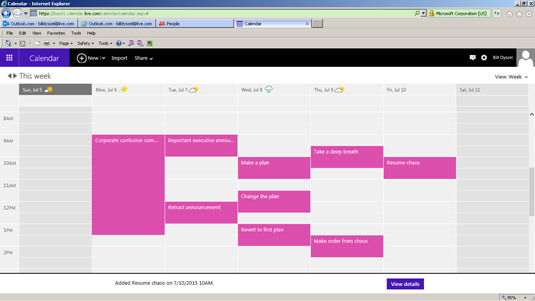 The appointments and meetings you post in Outlook are linked to Outlook.com, so from any web-enabled device, you can see where you should be and with whom. Now you’ll know when you’re available for meetings, lunches, and random tongue lashings. If you want your Outlook desktop data and your Outlook.com data to sync automatically, you must be using the same email address on both systems. Your calendar data won’t be the same if you sign up for an Outlook.com email account but use a POP account from another service on desktop Outlook. You can have multiple email accounts on Outlook.com; just create a new one and then link it to the preferred account you’re using on the desktop version of Outlook. Click the icon at the left end of the Ribbon and then choose Calendar. The Calendar shows your appointments. Your calendar displays your appointments. Click the New button on the toolbar at the top of the screen. The Add an Event form appears. Click the Add a Subject box and enter a name for your appointment. Enter something that describes your appointment, such as Meeting with Bambi and Godzilla. Click the Location box and enter a location for your appointment. Click the arrow next to the Calendar box and choose the right calendar. You can link multiple calendars to Outlook.com. Click the Start date of your appointment. If the pop-up calendar doesn’t have the date, click the arrows next to the name of the month in the small calendar until the date appears. Click the Time box and choose the time of your appointment. Select the start time for your appointment. While you’re entering appointment information, you can enter the location, end date, and end time. Click Add More Details to enter other information, such as meeting recurrence details. By default, your Outlook.com calendar will send you email notifications about upcoming appointments for the day. Click the link in the email message to see appointment details. An even quicker way to enter an appointment is to click the Day or Week button and then double-click the line that corresponds to the day and hour of your appointment. The Add an Event form appears, showing the date and time you chose.